Over five decades since its peak, Mid-Century Modern’s retro vibe remains the rage. From its sleek lines to free-form shapes and bright pops of colour, the timeless aesthetic of yesteryear stands as a firm favourite in homes across the globe. 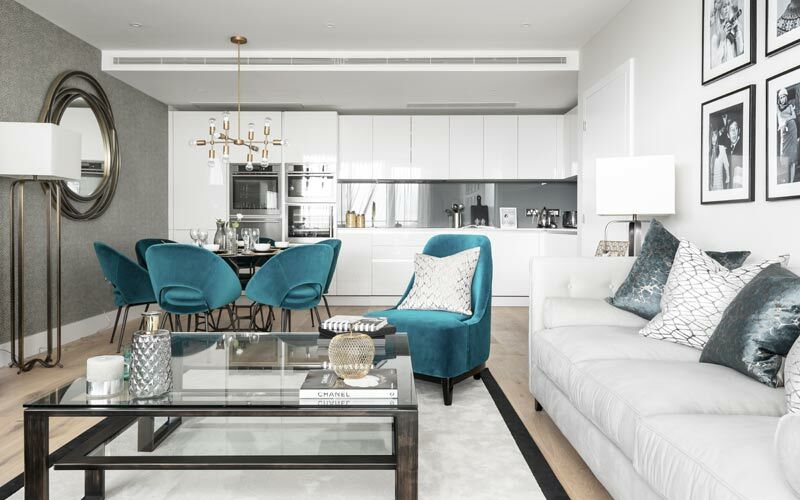 In charge of furnishing a show flat at Barratt Developments’ iconic riverside building Lombard Wharf, the ani M team leant towards a refined, elegant interior, with touches of Mid-Century Modern’s organic curves, geometric angles and stylish functionality. The apartment’s door swishes open to reveal an avalanche of colours, patterns and textures. 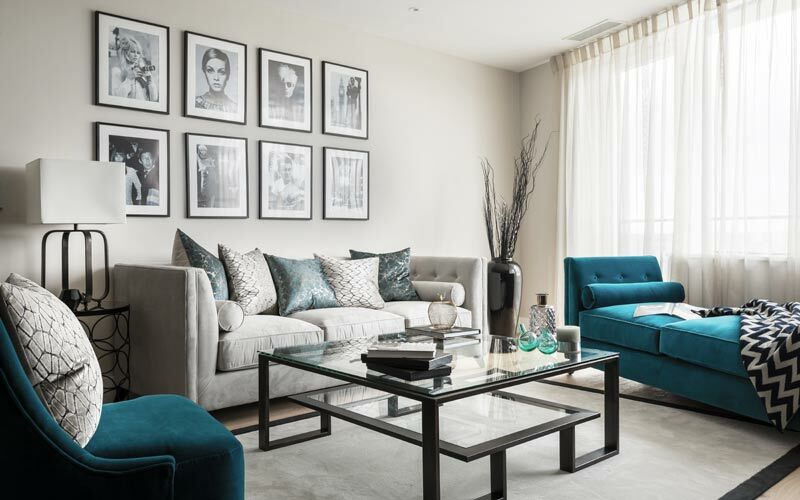 A daybed and armchair upholstered in sumptuously soft teal velvet punctuates the sun-lit living room. Geometric throws and cushions fizzle against a neutral backdrop. A collage of black and white photography and Mid-Century décor spark a retro love affair in a modern setting. A striking medley of furniture, decorative accessories and lighting fixtures lend both a nostalgic and unique feel to the apartment. A two-tier glass coffee table stuns with its bold lines and intricate frame. Against an accent grey wall, a stunning ridged hardwood cabinet acts as the perfect TV and ornament stand, while a statement ceiling lamp, with its linear grid shape and Mid-Century charm, hangs with a spectacular eclecticism. 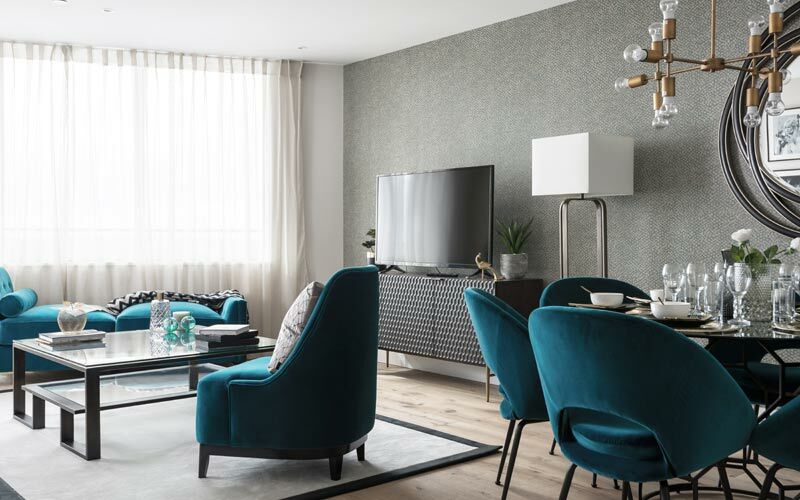 Other decorative accents peppered across the room, like a tall floor lamp, ornate mirror and table accessories, evoke a quintessentially retro vibe, which, together with the lounge’s more contemporary touches, lend the apartment a playful but pared-back style. 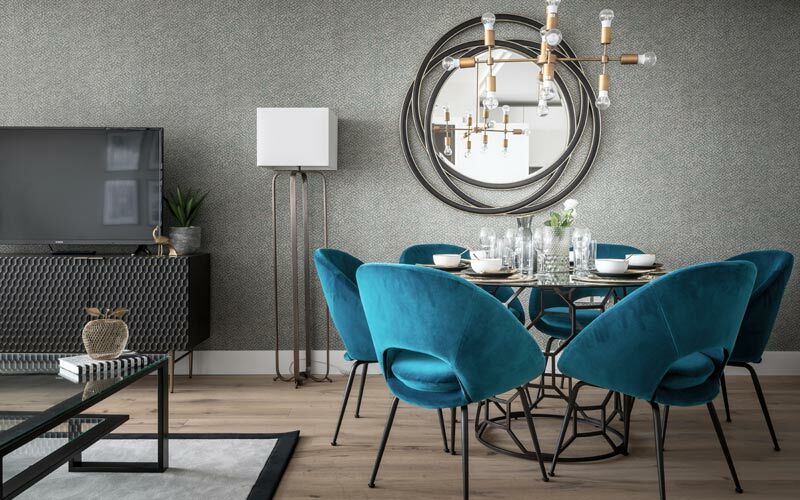 Tucked in the corner, teal dining chairs are solid blocks of brilliance against the room’s tamer neutrals – their velvet upholstery contrasting beautifully with the dining table’s intricate iron frame. Gold-toned charger plates and cutlery complete the elegant place setting, and tie the open-plan dining area together with a sophisticated finesse. 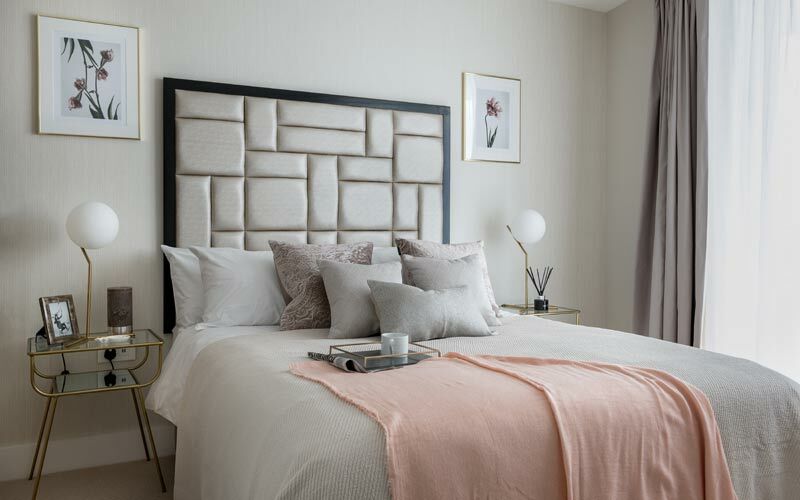 From soft blush to dusty lilac, pastel colours open up the master bedroom and create a soothing, tranquil space. 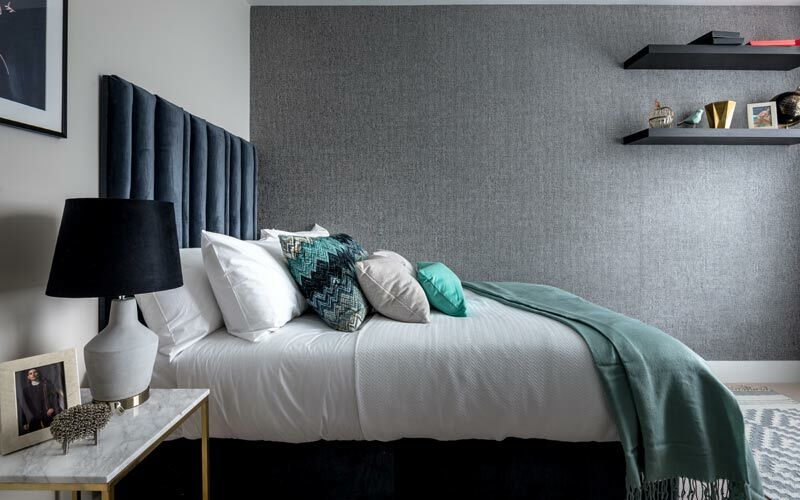 A bespoke headboard with iridescent upholstery and sectioned panels takes centre stage, turning the bed frame into a wonderful centerpiece. 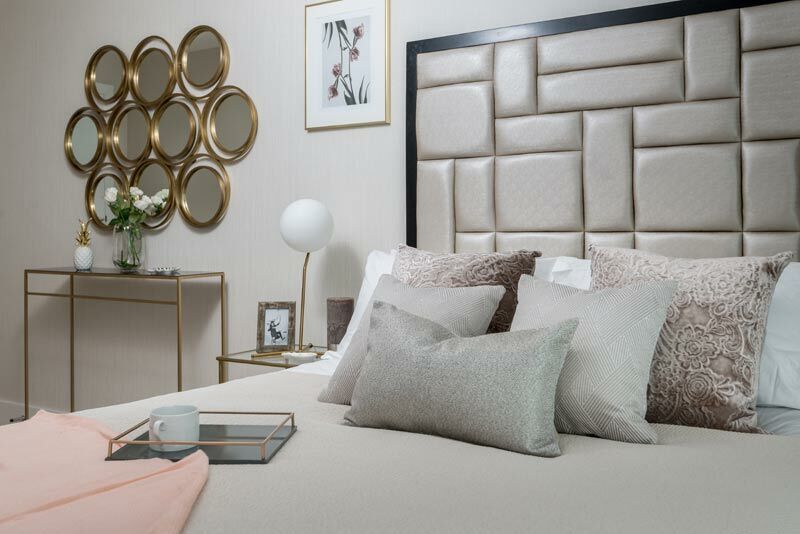 Surrounding it – delicate gold details with a subtle shimmer: two bedside tables pair metallic legs and a glass top for a striking, Mid-Century Modern piece, dome lamps illuminate with their sleek design and chic gold finish and a clustered wall mirror hangs pretty. 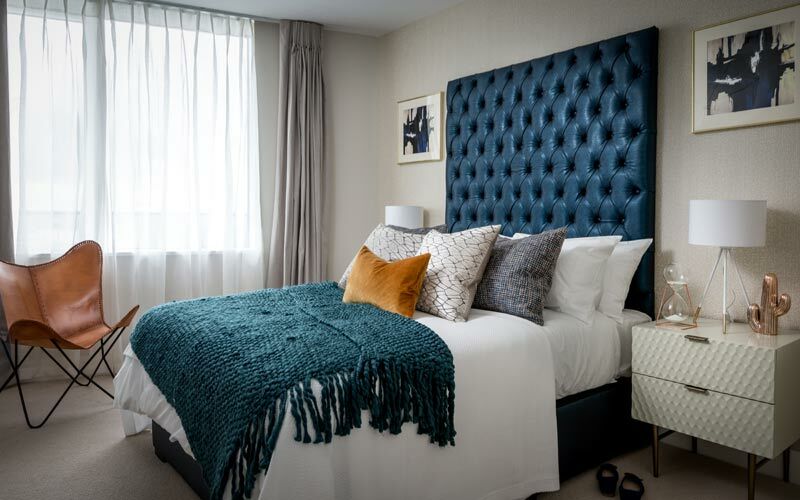 The master bedroom is a contemporary delight, balancing modern elements with timeless décor pieces and glittering golden accents to create a distinct style. Harmonising shapes, fabrics and finishes, no detail is spared in the second bedroom. A teal headboard and throw combine beautifully with a terracotta pillow and slouch chair – an unexpected colour combination that instantly evokes a feeling of warmth and familiarity. Quirky ornaments on top a Mid-Century bedside cabinet continue the offbeat, retro vibe, reminiscent of the fabulous ‘50s. In the third and final bedroom, moody blues and greens create a cosy sanctuary. Layers of soft furnishings are abundant, and make for a luxurious bed to fall into after a long day. A stylish study-corner inspires productivity, with a dazzling gold lamp, wired chair and framed illustration that come together effortlessly. Each and every room emanates a delicately refined, boutique-hotel feel, and, as a show apartment, the fine details are wonderfully evident, embellishing every corner and surface with a unique charm – even spilling out onto the balcony, where Bauhaus loungers and tropical prints create the perfect outdoor space to watch the world below. Subtlety and thoughtful craftsmanship are much of what makes Mid-Century style timeless. From luxuriously low-slung furniture to tall, slim lampshades and big, bold hues, the finished result is a show flat of unwavering glamorous attitude and exquisite details. Interested in adding some Mid-Century edge to your own property? 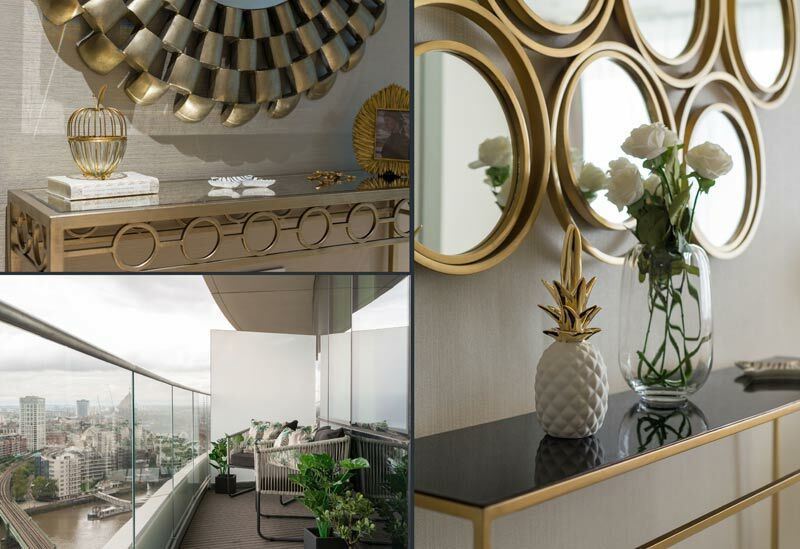 Get in touch with our design team today for a show-stopping interior.